I bought for a lot of money, for me anyway, the most wonderful Tub chair, height adjustable and rotates, I use it for my dining table and is also by my Balcony door. It is in a lovely micro suede cream material and is totally unsuitable for day to day use but I love it as it is so comfortable. I discussed with my friend Gwen, who is a wonderful sewer, not a quilter, how to make a loose cover as we thought a quilt would not work, tried one and we were right. W spent most of the afternoon tearing our hair out as it had to look comfy and right but could wash easy and then BRAINWAVE make a quilt but in a different shape, make it into a cross or + sign if you like. The centre will be the seat, the right and left hand "wings" would be for the arms and the other two for the back and front. I have just started it tonight but watch this space as I am really excited about it and have already ordered some more fabric to make a matching one for my Recliner! Sounds like a great idea for your tub chair. 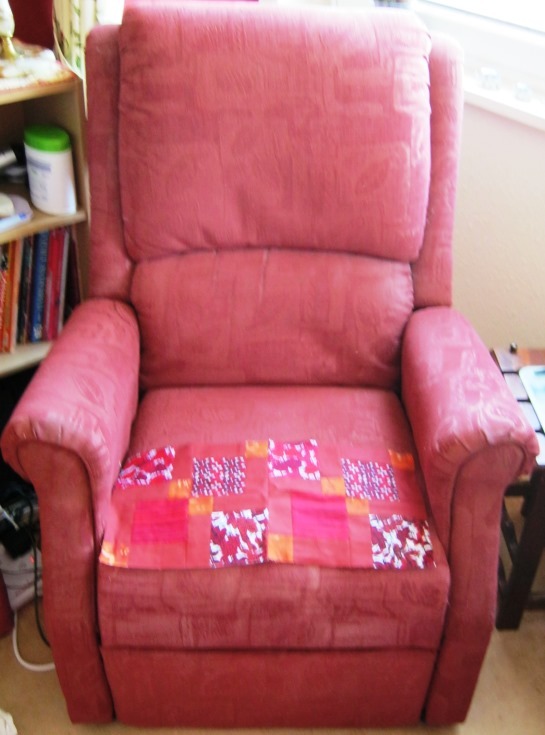 I made a sort of slipcover for my DH's (old, tacky, well-loved) recliner. I posted a picture on here then wrote a tutorial as I made a second one. It's in the Tutorials section. I think it's called Quilted Recliner Slipcover. Now I have another chair to cover and I'd love to see how your tub chair comes out. We're just about worn out the two I made for the recliner so if I still can't convince him to get a new chair, I'll be making a new one soon! 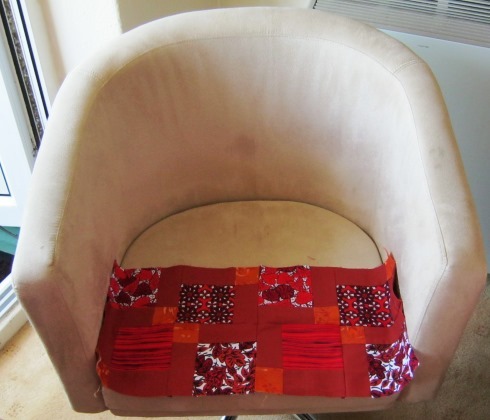 The cover mentioned above is very easy to follow I love the pattern and will be making myself for the recliner when it cools down. The office where I've worked for the past 28 years was purchasing new furniture (sofa) for the reception area. The old love seat being replaced had a hideous fabric on it, but the foundation of the love seat was built like a tank. I got the bright idea I was going to recover it. I stripped it down to the wood and the springs (hand tied springs). I added some additional very thick batting and made new seat covers for the detached seats, installing the zippers, etc. It was quite a job but cost me nothing but my time (my boss had the very nice upholstery fabric and gave it to me ) and an air stapler to attach the upholstery to the frame. I spent several weeks working on it, but I am really proud of it and it sits in my living room and is used quite a lot! I would not want to do upholstery work often, but it can be very rewarding if well done. Good luck on your project! What I've done in the past is to make a muslin slipcover and then use that as a base on which to sew - much like one would use muslin squares as a base to make a string quilt. I have microsuede furniture and it is very easy to clean. Just use a damp cloth to clean any spots. If you don't hate the color I wouldn't cover it at all. Why not take the cover off and use for a pattern? This is about the only way I would do it. Good luck and I hope it goes well. BTW I am doing D9P for speed as I have a load of charm pack squares in the colours I wanted, just laziness or being frugal??? 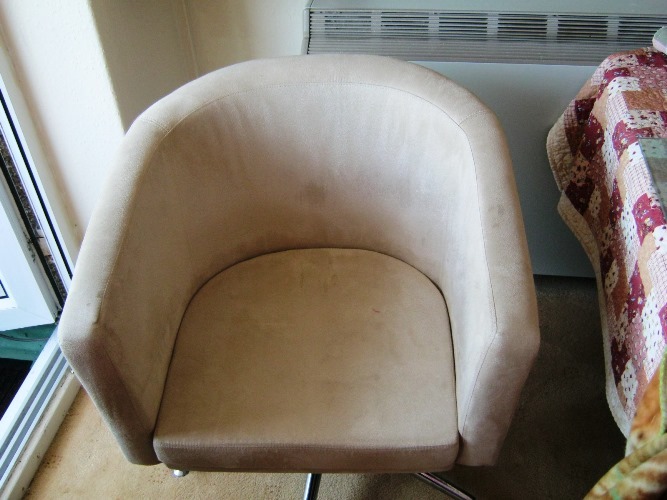 As I read your post, I am sitting in our motorhome looking at a very worn tub chair. A new upholstery job is certainly on my list of to-do's. Thanks for the idea and inspiration you and others have given today. I downloaded the .pdf of your recliner slipcover tutorial. Thanks so much for posting it. I actually sleep in my recliner every night and have for over 10 years because of sinus problems and when I had hip and knee surgeries. I've worn out 3 and this is my 4th. It is leather (the others were fabric), so are hot in the summer and cold in the winter, so I have been putting a fitted twin sheet over it, but the elastic doesn't guarantee that it will stay on. I've thought about making a cover for it, but have never made slipcovers, so didn't even know where to start. Your tutorial has all the information and the pictures are great. I will probably use the two-sided prequilted fabric instead of making a quilt or quilting my own fabric. Right now, I'm all for easy and convenient. Your tub chair is very nice and looks comfortable. It is not difficult to make a cover. make patterns of each section, I use muslin or old sheets, then add seam lines. Add any ease you want and be sure to make a pocket around the seat so it will give as you sit down. add elastic or ties to the bottom edge so it will be neat underneath. You can make it snug or loose and enjoy. I wish you much joy of your endeavor. Scrappy would be good and give lots of colors to brighten things up. Your chairs look very comfy. I can see you love them. Good luck, I am sure you will be able to cover them. make your sizes near as you can and lay them on the chair, right side down. then pin, pin, pin. you will trim your seams before sewing. It should be do-able. Good luck. I did some wing back chairs. finished mine but didn't finish my husbands. his started coming apart from his rough handling and I gave up. Bought different chairs. I love your tub chair! !